Custom Ball Ornament Wreath with abundant Red, Gold & Silver Ornaments, lit with Warm White LED mini lights. They are sold in 4' (150 lights), 6' (250 Lights), 8' (350 lights) & 10' (700 lights). 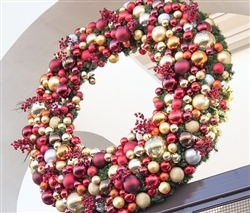 Choose the size you need to decorate and bring Holiday Cheer this Holiday Season. These wreaths are truly beautiful and lush. 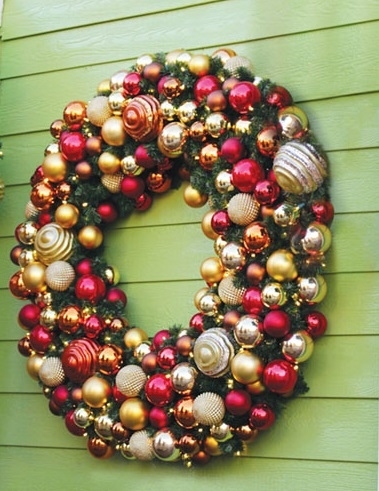 Wall mount Wreaths are a wonderful accent for your property for the holiday season! Sold one per carton. This is a one sided wreath - if you want it to be double sided call us for a quote. Call for shipping rates. 4' weighs 35 lbs. - 6' weighs 100 lbs. - 8' weighs 125 lbs. - 10' weighs 260 lbs.